I'm delighted to announce Happy Valley, a new m/m romance short story coming out on the 30th! Happy Valley is a romance between two ski field employees on the slopes of Mt Ruapehu, New Zealand. It's super cute and sweet, a totally adorable fluff of love with a gorgeous backdrop! I wrote Happy Valley while I was working at the ski field, as a special request from one of my friends who'd read some of my stories and wanted me to write one for him. Romance meets snowboarding? Yes please! I added in some quad biking, another hobby I developed while working on the ski field, to blend a cocktail of extreme sport and sweet love. I'll post an announcement when it goes live, so keep an eye out! 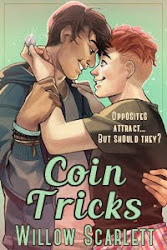 Also coming out soon: Coin Tricks - my m/m romance novel in which a security guard catches a cute guy stealing soap. 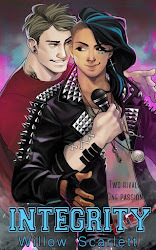 The release of Coin Tricks is extra exciting for fans of Jagged Rock, because when it's out I'll be able to focus on uploading Omega Blues, the sequel to Jagged Rock (about a werewolf rock band at college). Jagged Rock is free and Omega Blues will be, too: I'll be releasing it as a weekly serial on Wattpad. I've never worked on a serial before and I predict it's going to be an awesomely fun experience! There are plenty of delicious treats for your eyes and hearts on their way, so stay tuned!